UAE, Dubai, 17 February 2019: Visitors heading to Gulfood this week can meet their favourite Italian chefs, enjoy a food-tasting journey and sample authentic ingredients from over 200 producers at the Italian Pavilion which is now officially open for business. The Italian Trade Agency's pavilion was opened this morning by the Italian Consul General in Dubai alongside Gianpaolo Bruno, Italian Trade Commissioner to the UAE, Oman and Pakistan. For the first time this year, over fifteen experienced, Italian chefs from Dubai and Italy's best restaurants will be creating a wealth of dishes catering to a range of dietary requirements including, intolerances and allergies, food contrasts and vegetarianism, alongside modern interpretations of traditional family-favourites and an array of stylish and trendy recipes. All week, renowned Italian Chef Carla Brigliadori, will be showcasing Sfoglina or ‘the art of fresh pasta making' at the Italian Food Lab. Interested professionals and food lovers are invited to watch, learn and enjoy great pasta recipes and tastings. Tomorrow, Chef Walter Potenza, a passionate and accomplished practitioner of traditional and historical Italian cuisine, will be cooking with authentic Italian products at Tastes of The World. Also performing tomorrow is world-renowned, 3-star Michelin and master of innovative cuisine Chef Heinz Beck will be presenting modern, yet light and sensual recipes at Tastes of The World and at the Italian Food Lab Masterclasses on the Wednesday 20 February. For further info please click here . The Italian Food Lab will be hosting ETIHAD CREDIT INSURANCE (ECI) in partnership with Italian Insurance group SACE on Tuesday 19 February at 12noon, presenting the seminar Business Opportunities in the UAE for Halal industry. This informative seminar is targeted at Italian producers who would like to know more about the importance of Halal certification and procedures relevant to the food market in the UAE and Asian markets. 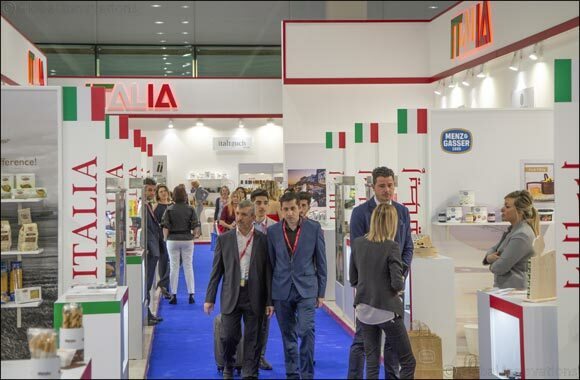 The Italian Pavilion is one of the largest at Gulfood and is supported by the Italian Trade Agency (ITA). It will be showcasing a broad range of authentic ‘Made in Italy' branded food products and crafted ingredients including grains, pulses, flours, pasta, rice, dairy products, canned produce, jams and juices, bread and baking, biscuits, sweets and snacks, seafood, oils and fats, condiments such as vinegar, coffee and beverages. The perfect event for importers, suppliers and distributors who will find everything they need to outsource. Continuing the food celebrations, the Italian Trade Agency will be hosting the TuttoFood Event (an Italian phrase that celebrates and means all food!) at the Four Seasons Resort Jumeirah on Wednesday, which will be a special night to promote and celebrate one of the most important food fairs being held in Milan later this year from 6 to 9 May 2019. The international B2B show is dedicated to food & beverage and in just six years, it has become highly regarded in the national and international food and ingredients scene.